Read the brief article below and study the diagrams. They complement the podcast. For more depth, LISTEN to the 37 minute audio with the player above. A full transcript of the podcast is also included at the end of this post. The Youtube version is at the end of the article (turn on the captions, if you need them. If you are a podcast listener, please also subscribe to the audio podcast (search for 'Reinventing Transport' in your podcast player app or click the symbol that looks like a wifi icon in the player above). trajectories of cities where incomes have risen later: newly-rich, middle-income and low-income cities. The Blue boxes and arrows are city types and trajectories relevant only to the earlier-developed cities. The Red boxes and arrows are relevant only to the later-developing cities. And Purple boxes are relevant to both sets of cities. Later you will see two diagrams with these two stories shown separately. By the way, this is a new-and-improved version of diagrams in my thesis. Feedback welcome, of course! There is lots to nitpick here potentially. 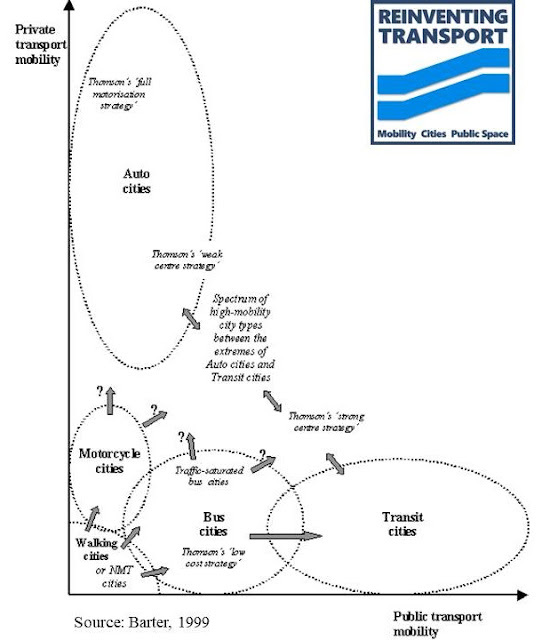 But first, here are some images to clarify some of the transport-based city-types in the diagram above. These are from publications by Newman and Kenworthy. But the idea of transport-based city types has quite a long tradition, including for example, Schaeffer and Sclar's 1975 book 'Access for all: transportation and urban growth'. And this one, is from my 1999 PhD thesis. A key argument in this episode is that many cities that become overwhelmed by traffic are NOT actually Car Cities. Many cities in middle-income countries that suffer terribly from the impacts of traffic have not (yet) remade themselves to suit cars. They are not (yet) automobile dependent. The nastiest crises from traffic tend to happen when car-ownership rises quickly in large Bus Cities, Tram Cities, Bicycle Cities or Motorcycle Cities. In other words, rapid increases in car ownership make an awful mess of these relatively low-mobility cities (more on this below). they are almost always rather high density cities. And car ownership and use can increase much more quickly than land-use patterns and road provision can adapt. these city types lack enough congestion-immune Right-of-Way A public transport, such as urban rail. I like to highlight a smallish set of cities that have become Traffic Saturated and then escaped this situation without becoming car-dependent. This is what I call the New Transit City strategy (another heuristic). J. Michael Thomson provided another take on this in his 1977 book, 'Great Cities and their Traffic'. I think the New Transit City strategy is akin to Thomson's Traffic Limitation Strategy. The next diagram (from my thesis) shows both the main city types above and Thomson's archetypes. It also shows my interpretation of how these types compare in terms of personal mobility (passenger km basically) by both public transport and private vehicles. This emphasizes that the Walking Cities, Bus Cities and Motorcycle Cities are relatively low-mobility cities. Tram Cities (small and medium-sized cities in the West in the early 20th Century) were similar. The city names on this diagram are there because I mentioned them in the podcast. For more detail, listen to the audio or read the transcript below. Vienna is one of several examples of Western former Tram Cities that faced Traffic Saturation problems in the post-WWII period and responded in a New Transit City style. Why was traffic saturation generally less extreme in the rich-earlier cities? Cities in the West did face Traffic Saturation problems as car ownership surged. Tram Cities like Vienna were mentioned above. But generally the crisis was less extreme than the later problems in developing countries. One reason is that most Tram Cities were small or medium sized. And the Western and Japanese cities that were very large were Old Transit Cities where urban and suburban rail offered an alternative as street-based public transport became mired in traffic. Public transport in these richer-earlier cities was also more extensive than in the post-war developing world, so the richer cities could afford to build more public transport. As a result, urban densities in these cities had already declined to middle-densities (roughly between 70 and 120 people per urban hectare or 7,000 to 12,000 persons per square km) before cars flooded in. Being slightly less densely populated made it easier to cope (but it also increased the risk and tendency for Western cities to become thoroughly car-dependent). Several factors have made traffic saturation an epic problem for many developing cities since the 1960s. Many became very large (>5 million people in many cases) while still Bus Cities or Bicycle Cities or Motorcycle Cities. 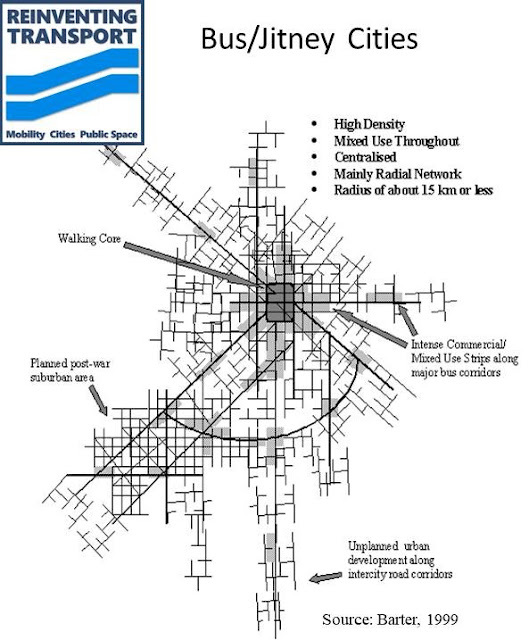 A large population with transport based mainly on these modes inevitably means high densities. But having an urban structure ill-suited to cars and better suited to public transport is also potentially an opportunity for cities that are able to seize it by following the New Transit City strategy. A previous episode focused on Singapore's story, an example of the New Transit City strategy. This Reinventing Transport article covers some similar ground and links to a book chapter with more detail. A few years back, I suggested that folks in developing cities Look to the New Transit Metropolises. If you are really keen, you can even look at my 1999 PhD thesis. Please do share it on social media or with any of your friends or colleagues who might be interested. subscribe to the audio podcast (search for 'Reinventing Transport' in your podcast player app or you can click the symbol that looks like a wifi signal strength icon in the player below). You can help me continue this work by becoming a Patreon patron of my efforts. Welcome to the Reinventing Transport show, the international podcast that helps you push for better urban mobility and better cities. This episode of Reinventing Transport is about knowing your city, knowing how your metropolitan area got to be the way it is and how it compares with other cities around the world in terms of its transport and land use characteristics and, therefore, where it can go next. We can't magically transform Los Angeles into Hong Kong, for example. I'm going to draw on some of the ideas from my work a long time ago when I was doing a PhD under Jeffrey Kenworthy. And a theme of my work has been this idea of city types expressed in terms of their transport systems. One of the reasons for this episode is I hear a lot of confusion. For example, I hear people saying that Delhi for example is a car-dependent city. Eh, not exactly. Or people say that the New York City metropolitan area is a Transit City. Hmm, there's an element of truth in that but it's not quite right. Some people say that Seoul has always been a Transit City. Err. And if you're in a city in the developing world, understanding these things, and where your city sits and the potential pathways forward in the future, is really important. It's really important that you have some perspective - some international perspective even - on what kind of a city you've got and how it got where it is and where it might be going. It can help you to make some wise choices and avoid some mistakes in terms of what you're pushing for in your city. I'm going to talk a lot about city types or archetypes based on transport systems. Now this is a an idea that you might find simplistic, you know, I'll talk about things like Bus Cities or Transit Cities or Bicycle Cities or automobile dependent cities - car-dependent cities - car cities. These are all simplifications but I think they're useful simplifications. Because there's a really strong relationship between land use patterns and transport. This relationship was even stronger in the past, before urban planning was important, but it's still important. So transport policies and investments affect accessibility - how easy it is to reach a place. And that enables development in places that are more accessible. If you can't reach a place there's no point developing a building on it. Space is also consumed by transport. So different modes of transport consume space in different ways and that also affects what's possible and how densely things can be developed and in what what patterns. So transport policies and investments enable or even force certain land-use development choices. On the other side of the coin, different land-use patterns suit different modes of transport better. For example, dense concentrations of jobs and dense corridors of population suit for mass transit very well, whereas scattered jobs and scattered populations suit cars. And in fact, cars need things to be scattered to a certain extent because cars - car based transport - can't cope with high densities. The land-use patterns and these long-lived infrastructure systems are difficult to change - they change gradually. Of course, over decades the changes can be significant and we can certainly work to change the trajectories of our cities. So if you know where your city fits in terms of its transportation and land use characteristics, which are the legacies of the past, it'll be easier for you to think about what's possible in terms of pushing for change. I'll sometimes be lazy and talk about a "city" taking a decision, which is just shorthand for all of the political processes in all of the jurisdictions that added up to at a change of some kind. I'm going to talk about both cities in the developing world - what we used to call the Third World - or places where there are currently perhaps low or middle incomes and cars are not in huge numbers yet. But let me first tell the brief version of this story with respect to countries and cities that were industrialized and relatively rich even before World War Two. So the story is a little different for the two sets of cities. All cities, all around the world, before about 1860 were Walking Cities. The dominant mode of transport was walking and a city that became reasonably large as a walking based city had to have high density. So you'd get walk-up buildings of say up to five or six or even seven storeys. Some of the Middle East Walking Cities that are still intact - the old parts of the cities - like Sanaa in Yemen - very sadly war-torn now - but it's a beautiful example of ... its old core is a dense Walking City. By the way, before I go on to the next stage, let me just mention a few names some of the people who've talked about cities in this kind of way. Some of the first were people like Schaeffer and Sclar. Okay, so I'm drawing on a tradition here of people who've talked about cities in terms of their transport. So Walking Cities were high density if they had a large population because you just can't walk very far in a reasonable amount of time. So a large Walking City has to be very dense. And that brings us to the next stage because the Industrial Revolution increased the size of cities for various reasons. And so large cities by around 1850, 1860 in several European countries and in the United States were getting too crowded. They just needed to be able to spread out. And that prompted innovation in public transport. Initially horse-drawn trams were a key advance - horse-drawn streetcars is the name in North America - and rail transport, initially steam trains in the form of suburban steam trains, and later on slightly later on, metro-systems - subways or elevated rail but in the form of steam trains ... horrendously polluting but better than nothing, enabling these industrial cities to spread out a little bit. This created a pattern of land-uses which we can call public transport cities or Old Transit Cities. And exactly what they look like depended on how big the population was. So the smaller cities tended to be Tram Cities. They didn't need any rail based mass transit except the trams - the street cars. The huge Old Transit Cities, like say Paris London or New York City at that time, had metro systems that were rather intense throughout their main areas. They had trams as well and so they were reasonably compact dense - shaped by trams and metro systems. So intense development around metro stations and importantly a core area with a lot of jobs they often had suburban rail bringing people in from a wider hinterland as well. And the medium-sized ones had mainly trams, but maybe some suburban rail as well, but usually no metro system. Later on we'll see that the large Old Transit Cities - the ones that had big railway systems that were immune from mass transit [should have said "immune from traffic" here!] set themselves up for a slightly different future trajectory compared to the smaller Old Transit Cities. And so in North America, starting at around the 1920s, car ... mass car ownership started. This triggered a massive wave of a very different style of urban development much more spread out served by road investment. And so Transit Cities still had their Old Transit City core whether they were small Transit Cities or large Transit Cities. And all around them and interspersed between corridors there would be car-city style development. And so cities that had been small as Tram Cities before this period some of them became very very thoroughly Car Cities. So somewhere like Phoenix for example in the United States ... there's almost no trace of its Old Transit City because it was so tiny at that time. Places like Melbourne in Australia - most of the Australian cities - ended up as some kind of hybrid. Where there's the Old Transit City - there was some suburban rail and lots of trams - today we see a fairly thoroughly car based cities, but with some suburban rail left - and only in the case of Melbourne, trams. But you can still see where the Old Transit City was in the land uses and the patterns of development. But the really large Old Transit Cities like New York City and in slightly different ways places like London and Paris ... Old Transit Cities had large mass transit before cars became important. These cities vary in the extent to which they have added car based suburbs around the Old Transit City. So, even though New York City was a really big Old Transit City and the eight million people in the old core New York City City the real New York City part of the metropolitan region, it's surrounded by enormously car-dependent and lower density suburban areas. Places like London or Paris were growing slower in the car era and devoted less investment to roads compared to the North American case and so, even though they did add a lot of car based suburbia, it's not as car based and it's not as extensive as in North America. The Japanese Old Transit Cities that were large, like the Osaka metropolitan area or the Tokyo metropolitan area, added some car based areas but much much less because all of this happened much later in the case of Japan. The car era really only started in the 1970s in Japan. By then these cities were huge and growing slower than they had been. So you can see that cities today end up as some kind of hybrid. They're not necessarily completely Transit Cities anymore. There's really no pure Transit Cities anymore in the world. There are some very very thoroughly automobile oriented cities however. A few of the cities that had been small or medium-sized Tram Cities did something slightly different. They managed to resist in some way. So, just very briefly, some European cities - examples Stockholm, Munich, Vienna - didn't have much in the way of Right-of-Way A mass transit. Right-of-Way A means mass transit that is separated from traffic completely - you know nothing can get in the way if you have a Right-of-Way A. These cities had very little of that in the post-war boom years. But as they started to face traffic congestion and get saturated with traffic and car ownership rose, they decided to build subway systems or metro systems or suburban rail systems (or both). Similarly in North America, Montreal and Toronto and the San Francisco Bay Area also built metro systems in the post-war era. They are still rather car oriented metropolitan areas but they managed to become these hybrid places even though they didn't have much mass transit before the car era. There's a few cities that did have some say a significant mass transit at the time of the arrival of cars, Los Angeles for example or Detroit, and some of those cities decided to allow those mass transit systems to wither and to go fairly wholeheartedly towards the automobile city. Let me go to the developing world now because in many ways I'm addressing myself now to people who are living in middle-income cities or low-income cities and struggling with an a surge of car ownership and motorcycle ownership and trying to think what can we do. I'm trying to help you here to know what kind of city you are. And it's not so easy. So let me give you some city types - some names that you can pin on your city or at least think about pinning on your metropolitan area - and that will help you to think about what kinds of scenarios are possible. So, here is a city type: a Bus City or a bus/jitney city. So this is in some ways similar to the Tram Cities - the streetcar cities - that I talked about earlier from the West. But in the post-World War Two era, the second half of the 20th century, there was very little in the way of trams or street cars or rail systems in developing countries. There are some exceptions. Mexico City was able to build quite a large metro. Some cities have suburban rail. Mumbai in India has suburban rail. But most developing country cities, including most large developing country cities, lacked Right-of-Way A mass transit. All of their public transport was on the roads and mixed in with traffic and very vulnerable to congestion. So numerous cities in the 1950s, 60s and 70s, and even now in some parts of the world, the primary mode of transport was buses and what I call jitneys, which are mini buses. Now buses and jitneys, like trams, can't go very fast. They're not high-speed kinds of transport - certainly slower than suburban rail or Metro. And so a bus and jitney based city can't spread out very far. So if you had a big population as a bus and jitney city you'll end up with a very dense population. Slightly different but somewhat similar kind of city - in China we had Bicycle Cities in the 1950s, 60s, 70s, 80s. They were dense - Beijing Shanghai became big cities as Bicycle Cities initially. They didn't have much in the way of bus systems or and or subway systems at that time. They really functioned primarily as Bicycle Cities. And again - it's somewhat similar to the Bus Cities - the speed is around 15 kilometres per hour or less, and you can only spread out so far, so you have to be a dense city if you're going to be a big city with five million or more people. Vietnam had Bicycle Cities too but as they've grown since the 1990s they've become Motorcycle Cities. And this is a new kind of city. Taiwanese cities also changed from being Bicycle Cities to Motorcycle Cities. So again Motorcycle Cities - when you've got millions of small low powered motorcycles on crowded streets, they they don't go very much faster than bicycles actually, so you get a similar kind of density and mixed-use city if you've got a big city. Like Hanoi and Ho Chi Minh City are big cities as Motorcycle Cities. They are very very dense - twenty thousand square people per square kilometer again roughly speaking. At least they were at that kind of density when they were purely Motorcycle Cities. They're spreading out actually now as things are changing. So the story I've been telling so far about developing country cities ... They also started off as Walking Cities I should have said. So before the Bus City era of course we had Walking Cities. In the colonial era, colonial powers sometimes built a few trams and a little bit of rail but usually not much. Colonial powers were very stingy and so they built very small systems. And so, by the end of World War two most of these cities had very little in terms of public transport just a little bit of tram a little bit of bus. They were still primarily Walking Cities. But they became Bus Cities in the post-war era really. Because of the characteristics of those modes of transport - motorcycles and buses - we can still call these relatively low mobility cities. Whether it's by private transport on motorcycles or public transport on buses, you can't travel very far very fast in these cities. Whereas rich Western cities or Japanese cities with either a lot of cars or a lot of public transport, or both - these had been places that had been richer for longer - they've invested more in all kinds of public transport or private transport infrastructure. And they are much higher mobility cities. People can move further and faster. They're able to spread out more. Now, especially the car cities spread out. The Transit Cities spread out to a medium kind of a density. But in the developing world, any city that is large, if it's a Motorcycle City or a Bus City or a Bicycle City, it's going to have quite a high density. And the story as we go forward from here is, as some of these cities start to get richer ... economic success ... where do they go next? People want more mobility. They need more mobility. These crowded cities need to spread out. People want to spread out. Will they do that on mass transit or on private vehicles, whether cars or motorcycles? Before I get to that part of the story, let me just take a side track. A fellow called J Michael Thompson wrote a great book in 1977 called 'Great Cities and their Traffic'. And he had several archetypes which are very similar to the kinds of cities here. So he mentioned the "Full Motorisation" city, which is very much like the car-dependent city I've been describing. The opposite extreme within the rich world was the "Strong Center Strategy", as Thompson called it, that's more or less like the big Old Transit Cities, with large city centers served by big rail systems. And the hybrids in between of say smaller formally Transit Cities in the West that eventually ended up as some kind of hybrid between a car city and Transit City - he called that the "Weak Center Strategy". So somewhere like say Boston in the United States or Melbourne in Australia is a weak center city in Thompson's framework. And in the developing world Thompson talked about the "Low Cost Strategy" and that's very much akin to what I've been calling the Bus/Jitney City type. The final strategy from J Michael Thompson is what he calls the "Traffic Limitation Strategy". I'm going to tell the story that's related to that fairly soon and I'm going to call that the New Transit City strategy. By the way, J. Michael Thompson was an interesting fellow. He actually in some ways pioneered the pay-as-you-drive road pricing idea - I mean he didn't come up with that idea, but he helped popularize it in the United Kingdom in 1964 in a report that he was part of - he was a key part of. He was also a key figure in London's anti motorway campaigns in the late 1960s - successful campaigns that prevented the building of huge motorways through inner London. His 2010 obituary in The Guardian newspaper quotes him as saying that choosing a transport strategy is "the choice of a way of life ... a choice that may affect different sections of the population very differently... (and thus) a highly political question." So he he was well aware that transport strategies - transport choices - were far from being just technical questions. They are political questions. They're about our values - what we want our city to be in the future. And that that's the topic of this episode. What's the vision for your city? But you need to pay attention to where your city is now if you're going to know where it can go next. Okay. Let's get back to those big dense Bus Cities or Motorcycle Cities. They faced an enormous danger - and they still do. Any city that still is a big dense Bus City or Motorcycle City faces enormous danger if there's a rapid influx of cars especially. The reason for this is you've got high densities in these cities. If it's a big city then that high-density core area is going to be very large - over a very large area - and you're going to end up with huge impacts of traffic. Even a relatively small number of cars coming into an urban area that is a Bus City type or a Motorcycle City type will create an enormous mess because there's just not much space in that kind of city for the cars. These cities tend not to be very rich at this point and can't invest very much in new road capacity to try to spread themselves out. With high densities it's also very very difficult to provide enough road capacity. Even if you invest in in major road systems, with high densities it's hard to change the structure of your city fast enough to cope with the influx of cars. The people are not very rich and they can't afford to spread themselves out and suburbanize very rapidly. You'll get a little bit of that. Bangkok in the 1990s, and since then, has been spreading out and suburbanizing as there was an influx of cars. But the old core Bus City area of Bangkok is still enormous and still clogged with traffic. I call this situation the Traffic Saturated City. So Bus Cities - former Bus Cities that get flooded with cars - former Motorcycle Cities that get flooded with cars - I call these Traffic Saturated Cities - a new city type - well their land uses are not fundamentally changed yet but they've got a new situation. And so we see examples of this over the last 30 or 40 years all over Southeast Asia, all over Latin America ... Most of the large Chinese cities had a period of this and maybe some of them are still in that. Many of India's cities you could call traffic saturated cities today. Jakarta is a great example of a Traffic Saturated City. Delhi is an example of a Traffic Saturated City. So all of these cities, what was it about them that made them vulnerable to being traffic saturated? They lacked mass transit that was immune from traffic so these kinds of cities get all sorts of nasty vicious cycles. As the buses slow down and get mired in traffic it becomes more and more tempting to buy cars. Some of these Bus Cities didn't have very many motorcycles in the Bus City era - they were not Motorcycle Cities. But many of them see an increasing number of motorcycles as they motorized because they then become almost the only way you can move around easily and bypass the traffic jams. So we've seen this in Indonesia, India. Manila which famously had very few motorcycles or bicycles - it was really thoroughly a Bus City and a jitney city - today has more and more motorcycles as it gets clogged up in traffic. We see this happening in Latin America as well. Almost all of them tried initially to accommodate cars. That was the initial thing. Increase road capacity ... try to plan for dispersal - many of them came up with plans that tried to reduce densities, reduce the intensity of development in the center, spread development out. They started to impose car-oriented planning norms inspired by American norms, such as wide streets, setbacks, parking requirements - minimum parking requirements or standards, etc. But I mentioned the New Transit City strategy or what Thompson called the Traffic Limitation strategy. Some cities that were faced with this traffic saturation problem chose to change direction. Most of them started by trying to accommodate cars but, after a little while of that not working very well, they took a change of tack. These are different from Old Transit Cities. The New Transit Cities are cities that were Traffic Saturated cities. Remember they didn't have much mass transit. They had little or no traffic-immune mass transit at the start of this pivotal era. Examples of this include Singapore, Hong Kong, Seoul, Taipei to some extent, Shanghai, and even to some extent some Latin American cities like Curitiba and Bogota. I'll also mention some European cities. So what happened in the following years as these cities embraced that strategy? ... which I'll explain the details of that strategy shortly. But the key thing is they managed to slow the rate at which private mobility was increasing. So car ownership ... they managed to slow the increase the increase in traffic. They managed to slow it down. Almost none of them stopped it but they slowed it down. And they diverted the increasing aspirations as people got richer ... they diverted those mobility aspirations towards public transport primarily rather than private. So public transport mobility increased in all of these cities very significantly while private mobility continued to increase but at a much slower rate generally speaking. So it was a change in trajectory. So what actions have these examples that I've chosen done and what actions could your city? Suppose you are in a city that is a Traffic Saturated City - a very large proportion of the world's population right now are in Traffic Saturated cities - what could your city do to push itself in the direction of becoming more of a New Transit City? You can't magically become a Transit City instantaneously but how can you embark on that trajectory? Well, here's a series of things. And I'll try to be quick because I don't want to get too bogged down in all the details. Of course one thing you have to do is plan for mass transit. That's not necessarily the first thing you do but you'll be aiming to make it possible to build significant mass transit. And this has to be traffic immune mass transit. So for example Singapore embarked on a new Transit City strategy starting in the early 1970s and part of the plan was always to build mass transit - the MRT system - a metro system. It didn't actually open until 1987 but it was a key part of the strategy. Hong Kong similarly started to restrict cars from around the early 1970s and embarked on a Transit City strategy. The MTR in Hong Kong didn't open till 1979 and the Kowloon Canton railway was not double tracked and electrified until 1983 but nevertheless this was always part of the plan. Taipei was thoroughly a Motorcycle City by the 1980s ... it took steps in the 1990s to improve its buses and started to build metro systems in the 1990s. So it successfully made a transition from being a Motorcycle City towards being a New Transit City. So it's an interesting example if you're a city with huge numbers of motorcycles you should study what has been done in Taipei over the last 30 years. Curitiba in Brazil is very famous of course for being the pioneer with bus rapid transit. It was a Bus City that was rapidly becoming traffic saturated in the 1960s already and so the BRT efforts and the pedestrianization of the city center were a city-level response to the threat of traffic saturation and a successful one. Bogotá in the 1990s was faced with traffic saturation in a city that had been very much a Bus City. And so the Enrique Peñalosa administration late in that decade (1998 to 2000) initiated TransMilenio BRT and this was a relatively successful effort. Vienna is famous today being a being of successful Transit City but it wasn't always like that. It was actually a medium-sized primarily tram based city, so that the flood of cars in the 1950s was a real problem. It only had a small electrified rail system but the significant Schnellbahn or S-bahn developments were only from 1962 in Vienna. And it's only since 1978 that Vienna has had an U-bahn (metro). Vienna also has given a lot of priority on the roads to its trams and buses as part of its Transit City strategy. So in the new Transit City strategy, of course, transit - mass transit - is a key part of it. But they did various other things and this is important. If you are a currently a Bus City that's becoming a Traffic Saturated City and you think that all you have to do is build mass transit then you won't be as successful as these New Transit Cities in changing your trajectory. In various different ways all of them start to treat cars as a luxury. They resist the idea that cars are a necessity. Bogotá's 20% surcharge on gasoline sales - half of that surcharge goes to the TransMilenio BRT. Seoul has also for a long time had an urban fuel surcharge. Singapore - in in an episode of Reinventing Transport a few weeks ago I talked about the Singapore story, so I don't have to repeat it now. Parking has been a part of that policy, especially in Europe but also Seoul has business districts where parking supply is restricted. Hong Kong had an interesting policy which I highlighted in a blog post on my Reinventing Parking website. It turns out that in a 1970s if you were building a residential building in Hong Kong the parking maximums were extremely low. Some of the cities, especially in Latin America and Europe but also some of the Asian New Transit Cities, have made a big effort to improve the walkability and to create lovable places and do placemaking or to rescue much-loved parts of their cities - usually the older parts of the cities - rescuing them from traffic. So the pedestrianization of Europe's city centers, the improvements in Seoul city center, such as the Cheonggyecheon stream project and a few other projects ... Shanghai and other Chinese cities that are trying to be new Transit Cities are increasingly creating pedestrianized city center areas. The primary thing here is to make it more attractive and politically attractive ... there's a a payoff that's positive - something that people can see is a benefit from all of the negatives perhaps and the less politically palatable things of limiting cars. Making cars a luxury not a necessity is politically challenging to say the least, so making your city livable, walkable and a great place is something that people can relate to, at least, especially if you you were lucky enough as a city to have some loveable places to start with. And of course public transport is important but it's it's fairly utilitarian. People don't get very excited about it. But much-loved places are important as part of this package. The public transport efforts in all of these cities were more than just investment, by the way. They were also about institutions and the regulatory arrangements for public transport. So Seoul for example, in 2004 has drastically improved its bus organization and network and regulatory arrangements. There's a similar story in many of these cities. Most of these new Transit City strategies cities have not neglected the humble old buses and in some cases, the trams - the streetcars. And so many of them have improved them in terms of institutions and investment but also given them priority on the roads. The New Transit City strategy is not just about building Metro lines or BRT. It's about this whole package of strategies. Planning was also part of the new Transit City strategy. So Singapore is a prominent example of this but just about all of them have adopted a land-use plan for the metropolitan area that is increasingly transit oriented, shifting away from those car-oriented planning rules that came in the early stages of the traffic saturation response you remember I mentioned. So typically high densities are allowed near mass transit especially. Mixed-use is often allowed. So in the show notes I'll share some diagrams which are from my thesis 20 years ago ... my PhD thesis under Jeff Kenworthy. They'll give you a visual picture of the story that I've been telling. They're basically the two stories: one of them for the cities that were industrialized and relatively rich before World War Two and then also a diagram portraying how Walking Cities in developing countries became non- motorized vehicle cities - Bicycle Cities - or Bus Cities ... some of them became Motorcycle Cities or some mix of motorcycle and Bus Cities and almost all of them became traffic saturated as cars flooded in. And I've just finished describing the strategy of the New Transit City strategy, which in my thesis I called the modern Transit Cities. So where does your city fit? Is your city ... very few Walking Cities today ... but is your city is still a Bus City? Is it a Motorcycle City or is it a Traffic Saturated bus and or Motorcycle City? Is your metropolitan area looking like it's moving towards becoming an automobile city. I didn't go into that very much because that's well-trodden ground and my special contribution perhaps is to help the lower-income and middle-income less motorized cities that are still in the Bus City, Motorcycle City or Traffic Saturated City situations - to help you to see where you might go next. And I hope I've made a case that the New Transit City strategy, or some variation on that strategy, is not such a bad bet for cities that are Traffic Saturated. If you're traffic saturated you're probably still quite high density. You haven't yet rebuilt your city around cars. You haven't yet suburbanized and become extremely low density. You are not yet an automobile dependent city. I said earlier that was a mistake to say somewhere like Delhi is a car dependent city. It really really is not. The New Transit City strategy is perfectly suited to somewhere like Delhi - if you can put all of the pieces together. So I hope that's been useful for you. Please do give me feedback. I'd really love to hear from you how I'm doing with this podcast. Don't forget, you can always go to www.reinventingtransport.org for more information, to listen to other episodes, to find out how to subscribe, or to leave a comment, suggestion, or question. Go to reinventing transport dot o-r-g. This has been the Reinventing Transport show and I'm Paul Barter. Thanks for listening. Bye for now. I do not see any real inventions in this article. It is all about using the old systems and try to improve them a Little. What is needed is a real invention in transport which can make public transport as attractive as cars. To do that you have to forget about trains and busses as we know them. Reinventing Transport is what RUF has done (www.ruf.dk). It makes a DualMode system where bus and train is the same vehicle. It can use a special monorail to make it possible to change from road to rail at 30 km/h and back. In this way you can have a very fast monorail network combined with busses (maxi-ruf) driving in the streets with a chauffeur. A cost benefit analysis financed by EU has shown that a Network covering Greater Copenhagen will have a IRR(30) of 29%.